It's ironic when a firm like AIRTEL, which has perhaps among the most expensive internet access rates in Bangalore if not India, goes on record to say something like this. "There are millions of Indians who think that the internet is expensive and do not know what it can do for them. We believe that every Indian has the right to be on the internet. " And it's clear from everything around that FACEBOOK and AIRTEL both really don't understand what net neutrality is all about. Which is surprising again, since by now just about everyone else does. 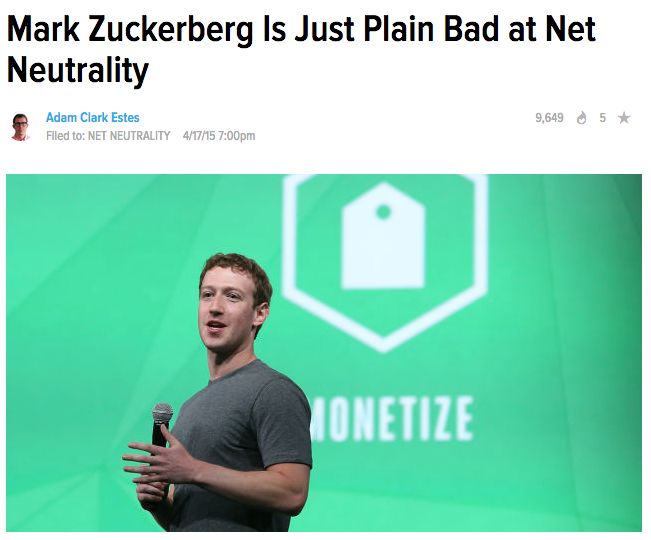 To understand why FACEBOOK doesn't seem to get it, first read this article on Gizmodo. It's also now clear, that AIRTEL doesn't seem to understand the concept either; since they compared a throttled, sponsored, discriminating version, of what was erstwhile a fair-treating, unrestricted gateway to everyone and everything in the world, to a toll-free number. 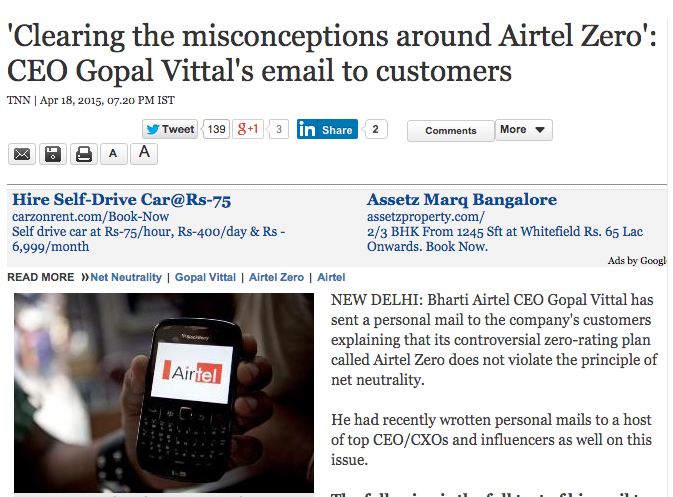 This below is an open letter by the CEO of AIRTEL. The only explanation to their inability to understand all of this is that both are just pretending to be dumb in public since privately they're fully aware that if they do pull this off, they stand a chance to make a whole lotta cash. Not just from all the money they'd make getting firms and apps to pay and negotiate for joining their platforms, but also as massive tax write-offs since all of this definitely has a lot of CSR twang to it. They're spinning it that way. "AIRTEL Zero does not discriminate" they say. Yeah. It only discriminates between those who pay you and those you don't. Tomorrow you'll have tiers and throttle bandwidth based on tiers. The day after that, your peers will follow you. Soon after, large and small companies and app makers will spend more time negotiating with you on all of this, than on creating wonderful things which people would happily pay a little for. A little while after that, innovation will die. At first, I thought I'd make this a longer tirade and go into every detail, but I shouldn't. You know about it and you deserve better. So, I'll get to the point. I actually already have. If companies like AIRTEL and FACEBOOK really cared about mankind, they'd work hard to make make Internet access cheap - not free.